A Smith Games (designer of Old World New World) is launching our first Kickstarter campaign, for SHEEPLE: The Best Game in the Ewe-niverse on October 23rd. Over the last eight years, I’ve had the game played hundreds of times with different groups of people of various ages, with different types of tastes in games. Children fall in love with the game, and it’s a blast to play with adults as well. The game is art and design complete. The campaign will ask for $25 a copy, with free shipping to the US, international-friendly shipping, and bulk discounts. The campaign will last 24 days, starting October 23rd, and ending November 16th. 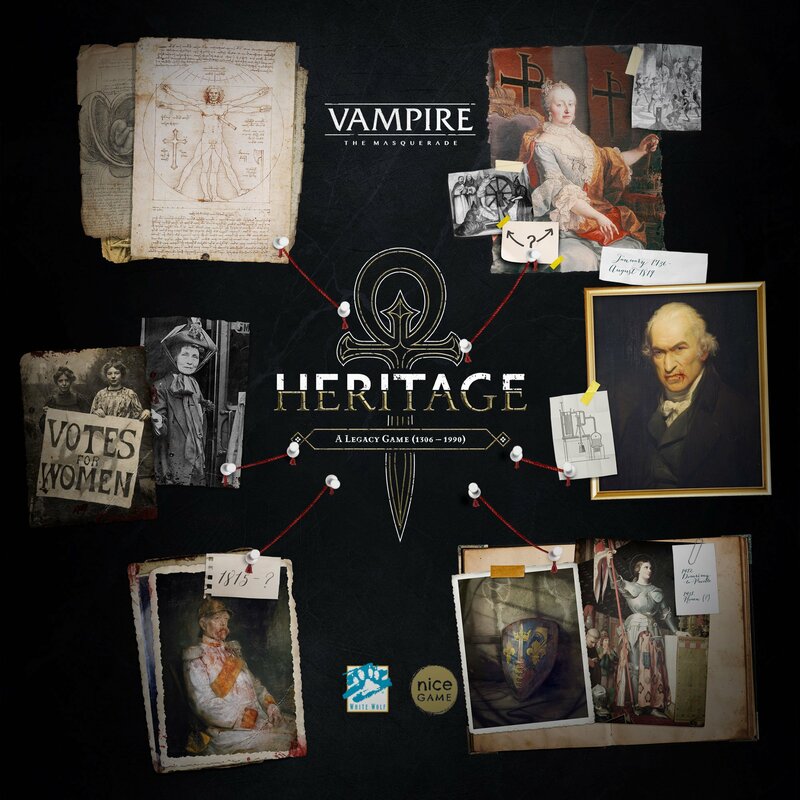 All backers can expect to receive their games by May 2019. In the game, you’re a sheep who’s trying to become a sheep-person. You start at the E-lamb-entary School, and the first player to graduate from the Ewe-niversity wins! 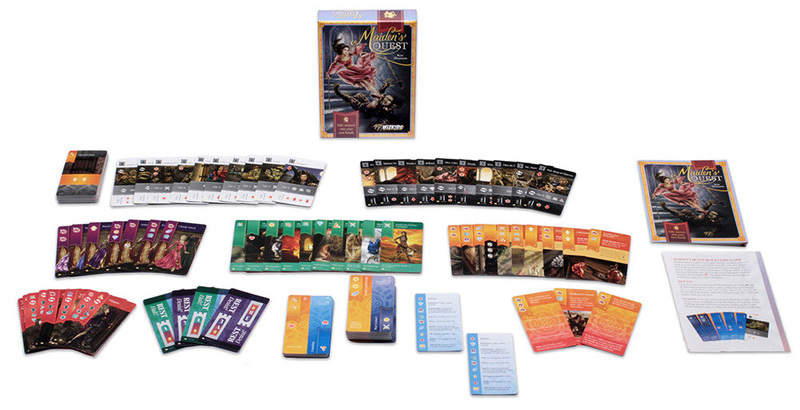 Each turn, a player picks a category, and each player has a minute to write down as many items as they can think of. They, they compare answers. You only score points if other players also put them down. So to win, you must Think like a Sheep! However, if answers are a little unique (only two players match), they score double points, so SHEEPLE encourages both inside-the-box and outside-the-box thinking. As a natural creative, I wanted game this to stimulate the creative side of the brain. It turns out that rapid brainstorming for a full minute is a little difficult – most people go brain dead after thirty seconds. Fun for Sheeple of all ages! However, SHEEPLE pros are able to continuously generating new ideas, while keeping in mind answers that their friends are likely to put down. Sheep puns are very key to the SHEEPLE world. The game contains around 80 sheepish puns, with a special game mode available where players score extra points for incorporating sheep puns into their answers. I’ve had a lot of fun marketing this. Here’s a SHEEPLE Rap Video I made, as well as a Star Wars Parody at the San Diego Comicon. Running around dressed like a sheep at Gen Con was a hoot as well. I even ran a Matrix-themed giveaway with secret sheep-themed messages. Stretch goals will include new characters and cards, and Spot UV for the box, with Kickstarter backers being able to vote on the stretch goal they would like to see next. Expansions: I really want to include all types of players. There’s an NSFW expansion for people who enjoy Cards Against Humanity, and a Christian expansion available for people who want something to play with their youth group. ENFIELD, NH, September 1, 2018 – Geek culture startup The Fourth Place is launching the Indiegogo crowdfunding campaign for a line of Game Night in a Bag and Game Library in a Box (and vice versa) collections selected and accessorized to be ready for players and businesses to go straight to hosting successful game nights. The Indiegogo preorder-based crowdfunding campaign runs from September 1st through midNovember, and can be found here. The Fourth Place can be found on their website and on Facebook. PRESS RELEASE: Take Matters Into Your Own Hands in Maiden’s Quest—Available Now! PRESS RELEASE: New Eggertspiele website and Coimbra available for pre-order! Hamburg, Germany (August 30, 2018) Hear ye, hear ye! Eggertspiele is ecstatic to introduce fans to its newly designed webshop! To match the newly designed logo, our webshop offers a fresh face to order your favorite games from. A news blog will also keep you up to date on the latest announcements and exclusive content, such as interviews with designers and artists. We invite you to visit often for all things Eggertspiele! 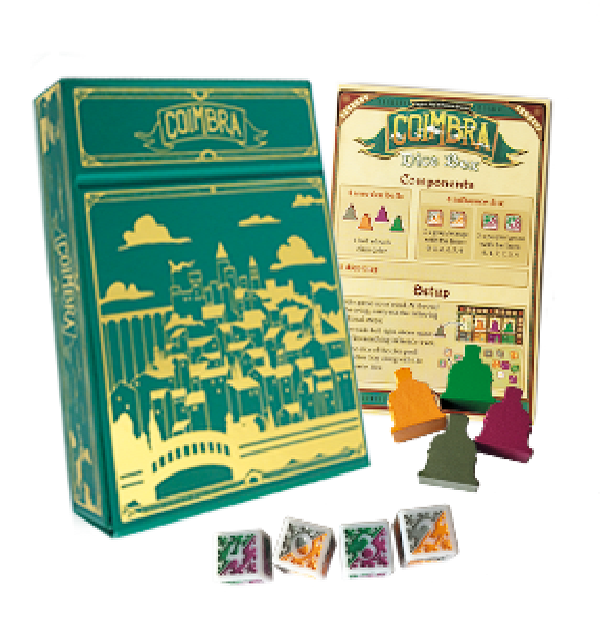 To coincide with the new Eggertspieleshop, we’re offering our latest game –Coimbra and its mini-expansion. The mini-expansion is an Eggertspielewebshop exclusive that provides fans with a new set of multicolored dice that deepens the strategy with every roll and an additional end game scoring mechanism: the Bells of Coimbra. 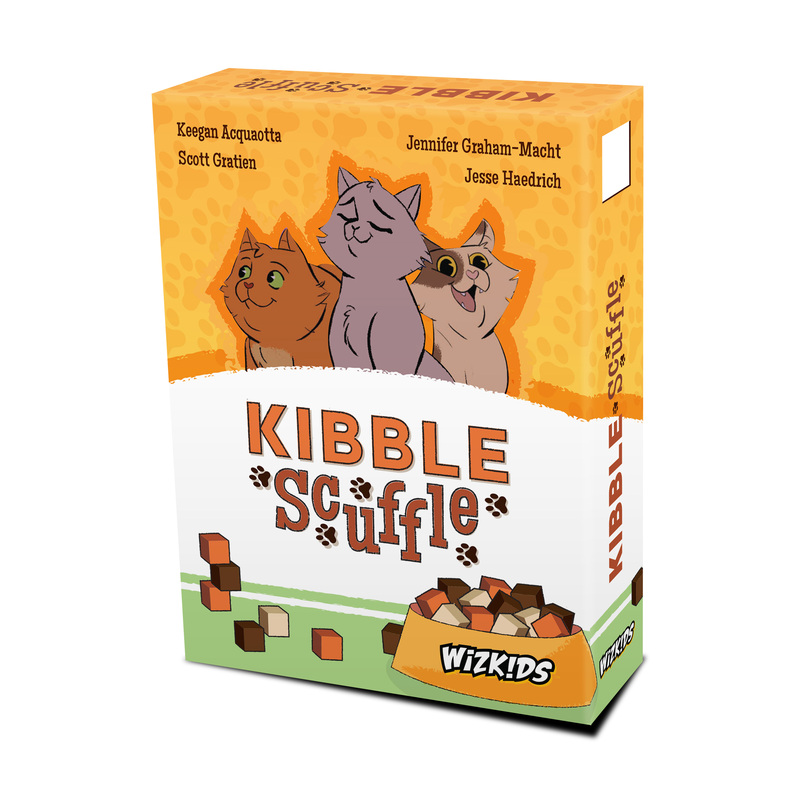 However, the real perk is the felt-lined box to store the components and also serves as a dice tray for the game! Fans interested in preordering the bundle before September 24, 2018 have access to a discounted cost. Authored by acclaimed designers, Virginio Gigli and Flaminia Brasini, and illustrated by the famed artist, Chris Quilliams – Coimbra has been well received by fans and critics alike. 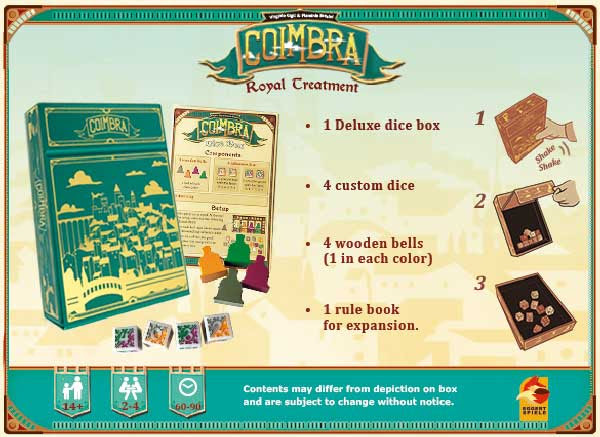 Coimbra has sold out within hours at Origins, Dice Tower Con, and GenCon. Now is your chance to bring home the next great Eggertspiele title! Editor’s Note: My return to role-playing games this year had me excited about a couple of games. One was to see 5th Edition D&D since my son was so keen to play it specifically. The other was Vampire: The Masquerade. 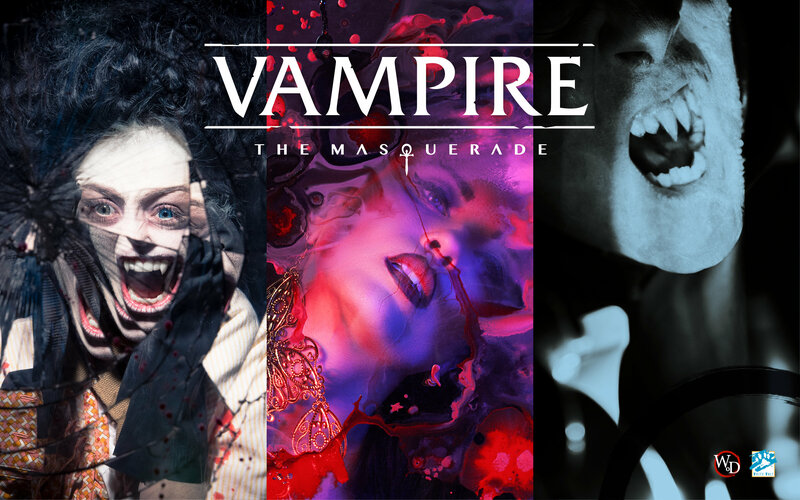 Chicago By Night – Vampire: The Masquerade 5th Edition — At GenCon, Onyx Path Publishing announced their collaborative project with White Wolf Entertainment: Chicago By Night. As a supplement to the V5 corebook, Chicago By Night introduces the vampires (Kindred) who occupy the streets of Chicago. New loresheets and scenarios advance the Vampire metaplot and introduce a variety of new stories and characters. Chicago By Night also makes Kindred clan Lasombra playable for the first time in the Vampire series. More Information: https://uberstrategist.link/Chicago-By-Night-Info. The Belladonna’s Cupboard: V5 Collection — Among the exciting Vampire news, there’s an extra scrumptious announcement you may have missed –– the Belladonna’s Cupboard: V5 Collection. Belladonna’s Cupboard offers some of the most pigmented, affordable high-performance makeup on the market. Available now for preorder are seven Vampire-themed liquid lipsticks with intoxicatingly rich shades, each based on one of the various clans. Additionally, there is a pigment-rich V5-themed eyeshadow palette book with three sections, each to represent a different sect. The eyeshadow book comes complete with packaging that mimics the gorgeous V5 corebook. Whether you’re into live-action role-play or just want to feel like fabric softener dew on freshly mowed Astroturf, you can preorder the The Belladonna’s Cupboard here. Tuesday, August 14, 2018 (Helsinki) – After a successful showing at Gen Con 2018, North America’s largest board game convention, Playmore Games’ Dized app has released in open early access on Apple’s App Store and Google Play. Players can download it for free on their smart devices. Used in conjunction with board games, Dized removes the most common barrier to playing games: learning the rules before playing. Through interactive tutorials, players are guided through their play sessions without any previous knowledge of the board game, much like how video games teach players today. Dized’s interactive tutorials differ from videos. They adapt to the number of players, seating positions (if required by the game), turn flow, and more, ensuring players are constantly interacting with the board game, each other, and the app for a learning experience like no other. Gone are the days of waiting for the designated rules reader of a group to figure out the game before playing or constantly scrubbing through a tutorial video to find exactly what you need. The open early access gives every user access to interactive tutorials for the award-winning games Blood Rage from CMON and Kingdomino from Blue Orange Games completely free, with Brain Games’ ICECOOL premiering on the app later this month as well. Dized’s first set of publisher tools arrive this month and promises to grow the app’s content even further by allowing companies to create living rules and FAQs for their games. Future interactive tutorials and living rules are planned with fan-favorite companies like CMON, Steve Jackson Games, IELLO, Horrible Games, and more already partnered. As part of the app’s growth plan, Playmore Games will launch a Dized Kickstarter campaign in September of 2018 that will allow the team to further their external tool sets by providing the game industry with one for creating their own interactive tutorials. Currently, tutorials are made in house, which is a significant bottleneck when combined with the app’s overall development. The campaign also allows Dized to be introduced to a wider audience through Kickstarter’s passionate community of backers supporting projects they believe in. “Board games are all about community, and Dized wants to support that by ensuring families, friends, and all other types of game groups can come together to play more games by removing unnecessary barriers. Getting that community support is vital to accomplishing this dream, and we believe Kickstarter will help us reach that goal,” explains Playmore Games’ CEO Jouni Jussila. Playmore Games will continue to update users about Dized’s upcoming Kickstarter project and the app on its social channels, including Facebook (@getdized), Twitter (@getdized), Instagram (@getdized), and their website (www.dized.com). Founded in 2014 by enthusiastic players and game designers Jouni Jussila and Tomi Vainikka, Playmore Games’ goal is to show there is a better way to learn and enjoy board games together. While the board games industry is booming, a significant obstacle remains: learning rules is a slow and tedious process. Playmore Games’ first app, Dized, will offer smart tutorials, setup guidance, a blazing fast rules lookup tool and other exclusive features to make the board game experience all about fun. Dized is being built by Playmore Games, founded in 2014 by Jouni Jussila and Tomi Vainikka. After a successful release of the Race to the North Pole board game, the company has been developing the smart device application. Dized has been in development since 2015 and is a registered trademark of Playmore Games.